We’d love your help. 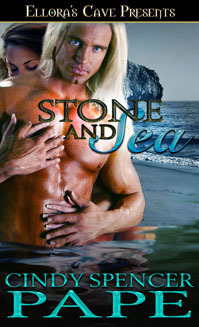 Let us know what’s wrong with this preview of Stone and Sea by Cindy Spencer Pape. To ask other readers questions about Stone and Sea, please sign up. That’s Remy, a gargoyle in human form looking for an ancient chalice, one of four sacred artifacts that can save his people. 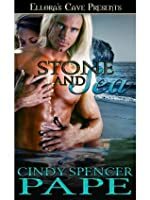 His quest for the chalice takes him into a hotel gift shop in Atlantic City where he meets, Mari, who he later finds out is a selkie. A hard, fast, smoking hot connection occurs between Remy and Mari as they search for the chalice while dodging bullets and lightning bolts from the Mob and a mad, millionaire wizard. A fun, fast read. I loved it. This was a really interesting series. The steam was plentiful and the story was engaging. The Gargoyle angle was different. It held my attention and I really liked the connecting story line. Cindy Spencer Pape has been, among other things, a banker, a teacher, and an elected politician, though she swears she got better. She volunteers in environmental education, when she can fit it in around writing. She lives in Michigan with her husband, two teenage sons, a dog, a lizard, and various other small creatures, all of which are easier to clean up after than the three male humans.